The Boeing 727 is a narrow-body trijet airliner that was produced by Boeing Commercial Airplanes for 21 years from 1963 to 1984. The 727 was designed as a follow-on to the Boeing 707 quad-jet airliner from which it borrowed the cockpit and some of the fuselage design. The Boeing 727 is a tri-jet with an engine each side of the fuselage just adjacent to the leading edge of the tail fin. The third engine was mounted in the tail cone of the fuselage and connected to an air intake atop the fuselage at the leading edge of the tail fin by an S-duct. The 727 could be described as an attractive aircraft as its aerodynamic lines, such as the wings were clear of engines. Boeing had never, and has never since produced a 3 engined aircraft. The Boeing 727 Specs were arrived at by a compromise between 3 major airlines who were looking for a new aircraft to serve some of their smaller city destinations. 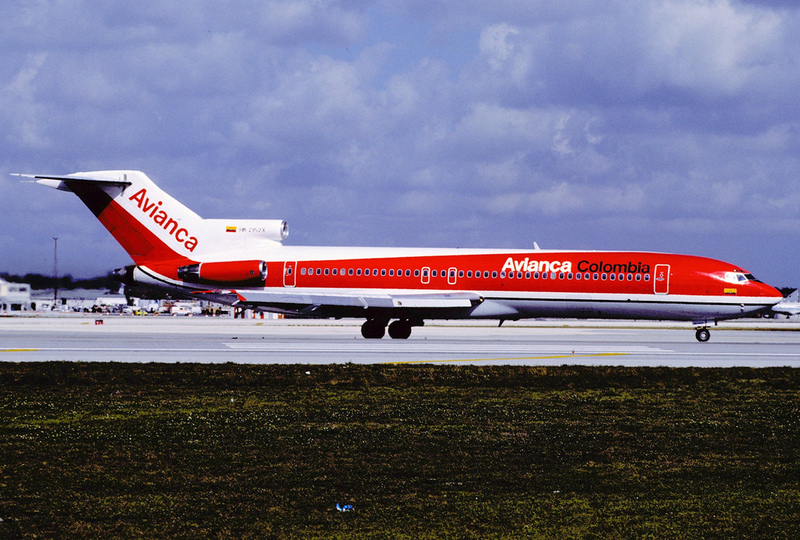 A Boeing 727-2A1 of Avianca, Colombia. The airlines were; United Airlines, Eastern Airlines and American Airlines. United Airlines was looking for a 4 engined solution but smaller than the current Boeing 707 or Douglas DC8. This was based on their requirement to operate out of their high, altitude hub at Denver. American Airlines, on the other hand, was looking for a 2 engined option which they saw as a more efficient option. Lastly, Eastern Airlines needed more than 2 engines as they had over water routes to the Caribbean. ETOPS (Extended Operations, or the more fun meaning, Engines Turn Or Passengers Swim) restrictions which govern the ability for twin-engined aircraft to fly over water, dictated that twin-engined aircraft must never be more than 60 minutes flying time from the nearest available airfield. At that time in the early 1960s, international routes were the realm of the 4 engined Boeing 707, Douglas DC8 and propeller aircraft such as the Lockheed Super Constellation, Douglas DC4, DC6 and DC7. The compromise was reached and development began. In the early stages, it was suggested that Boeing and de Havilland, which later became Hawker Siddeley, collaborate as both aircraft makers were developing a trijet airliner. In the case of de Havilland, it was to be the D.H. 121 Trident. Representatives from each company met and discussed the project, however, de Havilland wanted Boeing to make the Trident under licence, while Boeing for their part wanted an aircraft with 6 abreast seating and short runway abilities. The collaboration ended there. An Air Canada Boeing 727- 233F positioned nicely to demonstrate the air-stairs built into the bottom of the fuselage. The choice of engines for the 727 came down to two options, the Rolls Royce RB-163 Spey and the Pratt and Whitney JT8D. Whilst the Rolls Royce option was more attractive with 1,000 pounds less weight and further along in development than the Pratt and Whitney offer. Pressure from Eastern Airlines forced Boeing to go with the JT8D. This was the sole engine offered on the Boeing 727 in the end. The JT8D is a low bypass engine which made the 727 one of the noisiest commercial airliners. This would be rectified in later models in reaction to the US Noise Control Act of 1972. 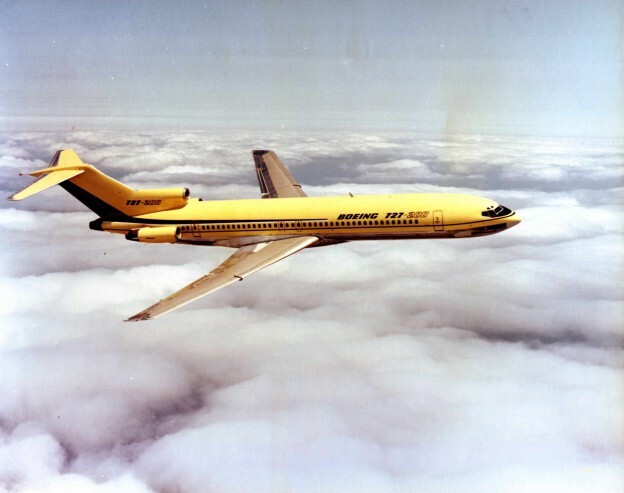 The first Boeing 727 had its maiden flight on 09 February 1963 and after certification testing, the first commercial hand over was to Eastern Airlines on 01 February 1964. 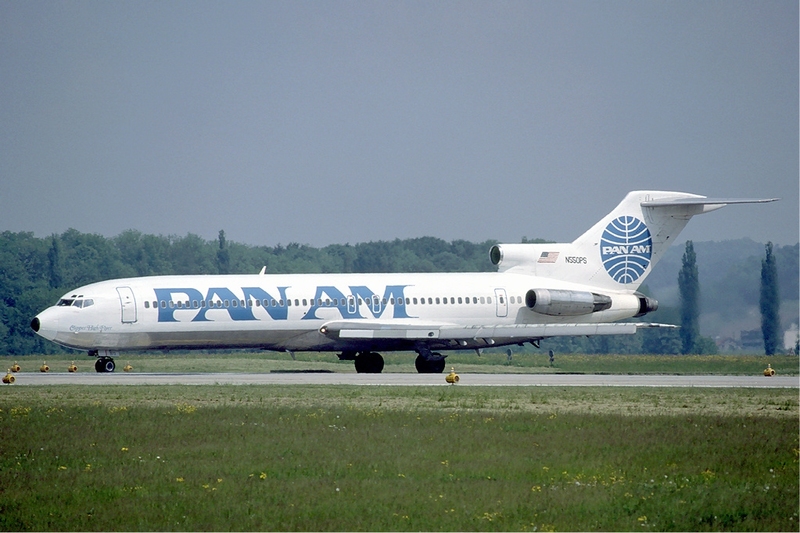 This 727 model was later renamed the 727-100 as a stretched version, the 727-200 was later introduced. The 727-200 first flew in July 1967 and began commercial operations with Northwest Airlines in December of that same year. 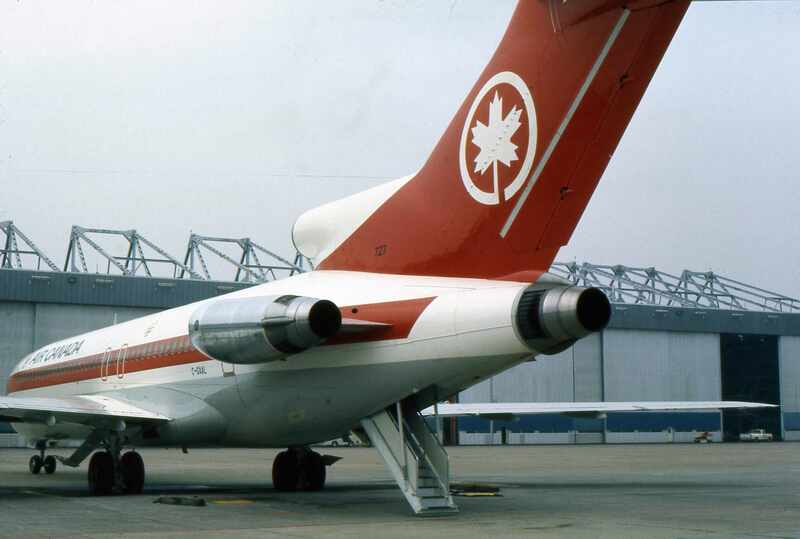 …..began commercial operations with Northwest Airlines…. Boeing enjoyed great success with the 727. For most of its 21 years in production, it was the highest selling jetliner in the world. This honour was taken by the Boeing 737 in the early 1990s. When production ceased in 1984, 1,832 727s had been built and 1,831 delivered. Boeing had held one back for themselves. A Pan Am_Boeing 727-200 at Zurich Airport in May 1985. As of mid-2013, there were still 188 727s in service with airlines, government agencies and freight companies. By mid-2015, the 727 has been involved in 336 incidents of which 118 resulted in a total loss of the aircraft. These incidents caused the loss of 4,209 lives of which 345 were caused by 178 hijackings. It was a turbulent time before the current stringent security measures came into being. The 727 was designed to be used from shorter runways of around 4,500 feet. This enabled it to be used to fly in and out of smaller city airports, as well as remote regional airfields as well. The Boeing 727 design had several advantages in that it allowed the short airfield operations but was still able to offer a good range. Rather than having to fly a short distance to a major hub and change to a larger aircraft, the 727 was able to fly directly from smaller airfields to many more destinations. …..727 was able to fly directly from smaller airfields…. The 727’s ability to operate out of remote locations is attributed to several factors. First, the aerodynamics of the wings. Because the engines are mounted on the rear of the fuselage, this leaves the wings clear of any obstruction caused by engine pylons. This means that lift enhancing equipment can be applied to the whole wing with no gaps. Leading edge slats, as well as rear moving triple slotted flaps, greatly enhance the 727’s ability to fly at slower speeds with greater stability. A Champion Air Boeing 727-2S7 Advanced. Note the aerodynamically clean wings, clear of engines. Many remote locations do not have the facilities offered by larger urban airfields, such as ground-based power, or air-stairs. To this end, the 727 was able to be self-sufficient. For power whilst on the ground, an APU (auxiliary power unit) was fitted. It was actually located in the centre of the aircraft between the main wheels, instead of the traditional tail cone location which of course housed engine number 2. This meant the 727 did not have to leave one of its engines running whilst on the ground to provide power. The 727 was Boeings’ first aircraft to carry an APU. To enable passenger access at small fields, Boeing built a stairway into a door that dropped down from the bottom of the fuselage under the tail. Initially, there was no fail-safe on the air-stair to prevent it opening in flight, in fact, military versions made use of this ability to enable clandestine parachute drops. A feature called the Cooper Vane was added after 1971 to prevent the door opening in flight. This was a result of the hijacker known as D. B. Cooper, who parachuted from Northwest Airlines flight 305 over the mountains between Portland, Oregon and Seattle, Washington on 24 November 1971. As well as short field capabilities, the 727 was able to operate into and out of gravel runways as well. Due to the engines being mounted much higher on the fuselage, they were further away from foreign objects being ingested than those of aircraft with engines slung under the wing. In addition, Boeing added brakes to the nose wheels so as to give more positive control and stopping power ability. 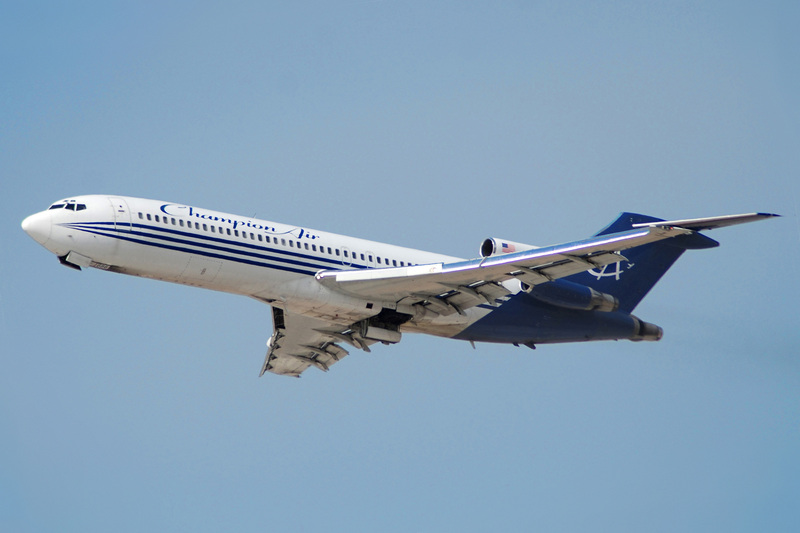 The Boeing 727 is a medium to short range single-aisle airliner, featuring 6 abreast seating. Two main variants of the type were produced, the 727-100 and the 727-200. The 200 was 6.1 metres (20 feet) longer than the 727-100 and together they enabled the 727 to cover the 120 to 180 seat market. The 727-200 was also offered in a variant called the 727-200 Advanced. The Advanced featured improvements in lifting capacity through airframe strengthening, more powerful engines as well as an option for a longer range version with additional fuel carrying capacity. 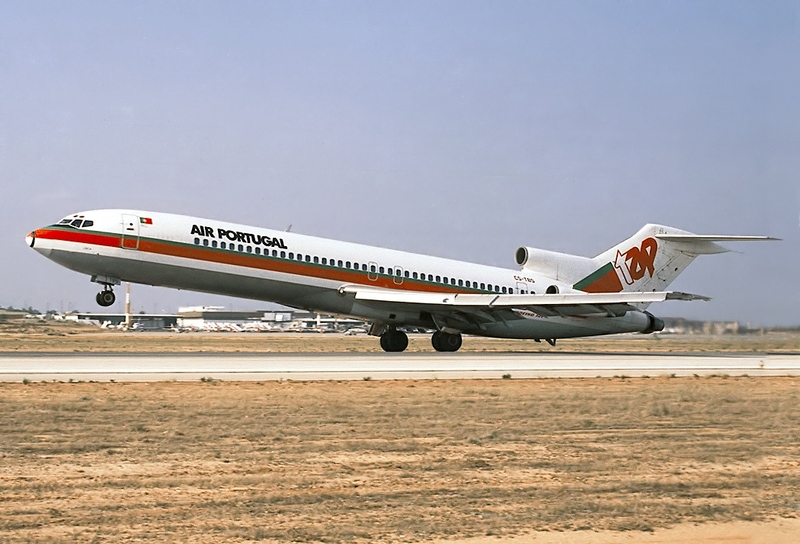 A TAP Air Portugal Boeing 727-282 Advanced. The 727-200 was 20 feet longer than the 100 with a 10-foot extension to the fuselage just in front and just behind the main wings. The Advanced version had more powerful engines and had additional strengthening to carry higher loads as well as coming in a longer range version as an option. Several modified versions of the 727-100 were also offered. Namely the 727-100C or Convertible. This didn’t mean it came with a soft roof so much as it came with options for a mixed passenger/cargo payload. Through strengthening of the floor, cargo could be housed in the rear half of the fuselage while passengers were seated in the front half. The 727-100QC or Quick Change was a concept where airliners could effectively utilise their fleets around the clock. By day the 727 was a normal passenger airliner. However, with the aid of rollers in the floor and modularised passenger cabins, the QC could be converted from passenger carrier to a freighter in 30 minutes. The aircraft was then able to be used to haul freight during the night hours. The 727 was what is known as a slippery aircraft. Due to its clean aerodynamic lines, it was capable of maximum speeds around Mach .9 or better. Today those speeds are rarely seen as the economics of flying those speeds at today’s’ fuel prices are not viable. As noise abatement laws were taking effect at more and more airfields, the need arose to quieten the noisy 727 engines. Hush kits were retrofitted to the Pratt and Whitney engines which allowed the 727 to continue to operate into affected airfields. Some of the older non-retrofitted aircraft were sold to airlines that operated into airfields which were not subject to noise abatement laws. 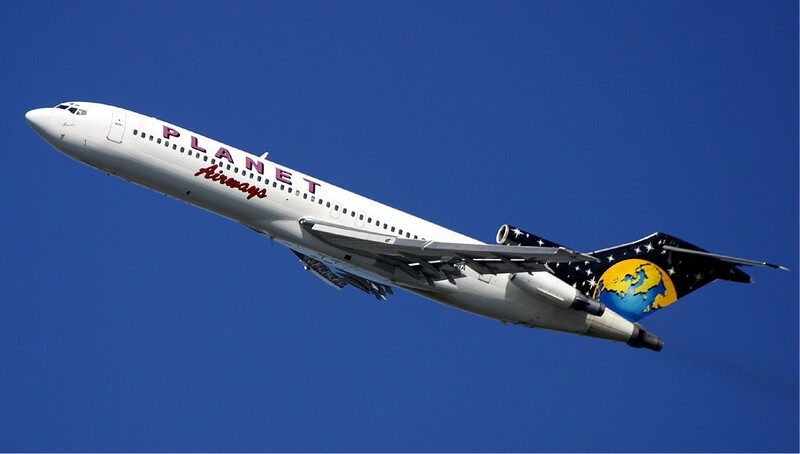 A Planet Airways Boeing 727-223. Whilst the 727 proved to be a popular workhorse for several decades. Eventually, new technology and economics caused it to be no longer competitive. Newer high bypass engines outperformed the JT8D. Because of the middle engine being located in the rear of the fuselage, there was no room to change to a wider high bypass option. In addition, the 3 man flight crew meant the cockpit was far larger than newer aircraft only requiring a 2 man crew. This is obviously lost revenue as far as utilising cabin space for paid seats is concerned. The 727 was a pioneer and beautiful aircraft, but like many was surpassed eventually by technological advancements and financial pressures. Undercarriage 2 x 2 wheel bogies under wing plus 2 wheeled nose gear. Price per aircraft at time of production. Initially$4.25 million, by 1982 $22 million. If you have any experiences you would like to share around the 727, we would love to hear them in the comments section below.